As a registered dietitian, I find that people mistakenly believe sugar is an inherent enemy of our health. They simply don’t understand that not all sugars are the same. It’s important to remember there are two types of sugars in the American diet: Added sugars, which include any sugars or sweeteners that are added to foods and beverages during processing or preparation; and naturally occurring sugars, found in foods like fruit (fructose) and milk (lactose). While the Dietary Guidelines for Americans have always referenced sugar intake, the newly released guidelines specify that it is only ADDED sugars that should concern us. By targeting ADDED sugars, a clear distinction is made between naturally occurring sugars found in whole foods and sugars that are added to foods in the form of various sweeteners. This means that when it comes to naturally occurring sugars, they’re not something you even need to think about. The 12 grams of naturally occurring sugar in a serving of white milk is now officially a moot point. Instead, we can focus on the fact that we’re getting the fuel we need along with all the other health benefits of dairy, like the nine essential nutrients that milk provides. ADDED sugars are the culprit when it comes to health concerns, so the updated dietary guidelines recommend that no more than 10 percent of our total daily caloric intake come from added sugars. Considering the average person needs about 2,000 calories per day, this equals about 50 grams of added sugar per day. That’s quite a generous amount! Flavored milk (chocolate, strawberry, etc.) is a smart choice, as it hardly moves the needle on added sugar intake. A serving of chocolate milk contains both naturally occurring and added sugars; of the 24 grams of combined sugars, only 12 grams are ADDED sugars. 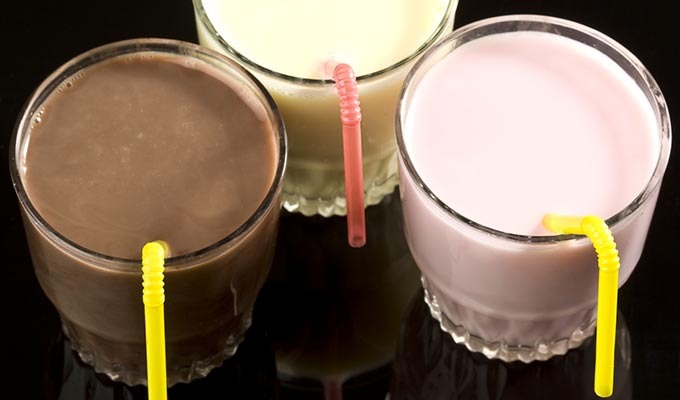 When you consider the fact that flavored milk provides bone-building calcium and muscle-building protein, along with potassium to help lower blood pressure, can you think of any wiser way to invest a mere fraction of your daily sugar allotment? And remember, if you are sensitive to the natural sugar lactose, you can enjoy all the health benefits dairy has to offer by choosing lactose-free milk. It’s real dairy – just minus the lactose.